This is a crocheted necklace, but you will also learn how to do the peyote stitch tube and the loomed Aztec symbol as well as the brick stitch end cap finish, and longevity. The symbol may be slide on or off of your necklace. Basic crochet is needed. This crocheted wire Urn is 2 1/2 inches long and requires only a small amount of experience with crochet to get you on the road to making this fabulous wire urn. Using 28 gauge coated copper wire you can create this unusual necklace. You'll also learn to wire wrap the finished crocheted work to complete this most attractive, scintillatingly seductive accessory. The Urn will be filled with sparkling beads and crystals for added effect. In this project you will be using tubular and flat brick stitch. The flap is made using peyote stitch so that it has better drape. Included are instructions for the 2-bead start regardless if it is flat or tubular. This will assure that no threads will be showing on your finished work. Plain and Branch fringes are used to get a very dense look. This is an extremely easy purse to make. Some basic crochet skills are needed. 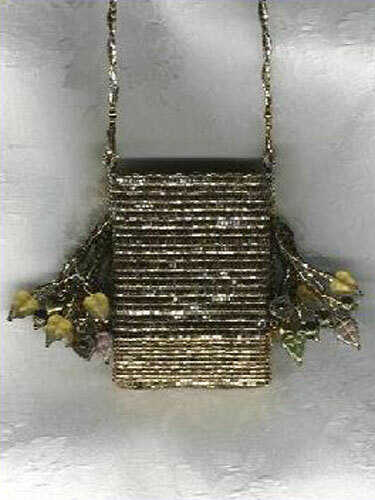 This purse is fashioned after a vintage purse found at an antique shop by one of my students (named Barbara). 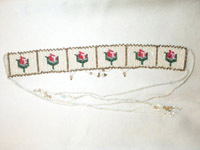 The beaded balls on the ribbon are designed to be worn on the wist as an added embellishment. This necklace is made using a very simple slip stitch. 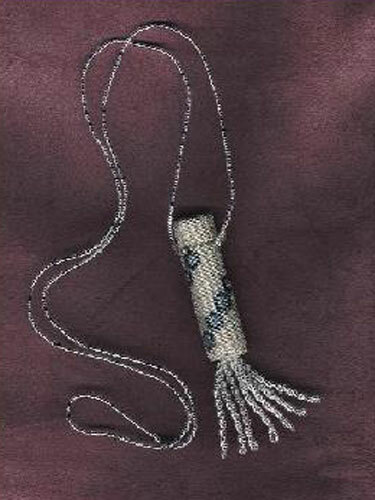 During the Flapper era, women made these nechlaces 6 feet long with tassels on the ends. 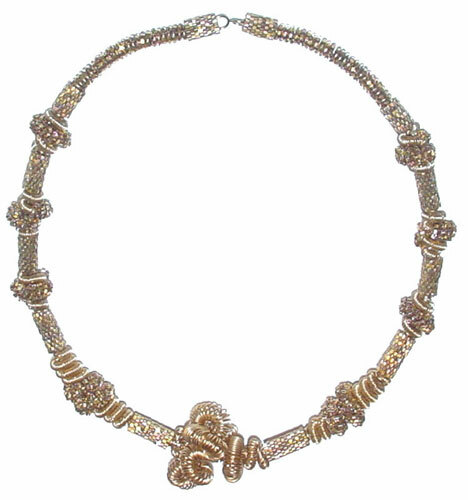 This necklace is an adaptation of the Flapper nechlace. 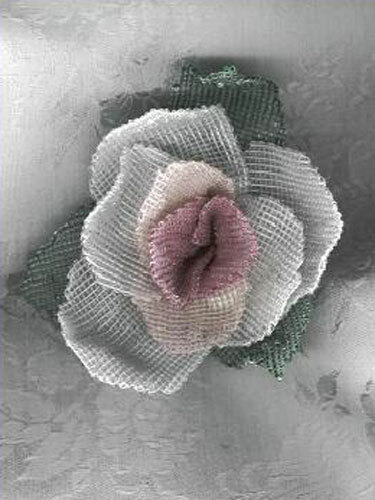 This is most unusual crochet technique. The purse is very fast to make. Basic crochet is needed. This purse is approximately 6 inches long. 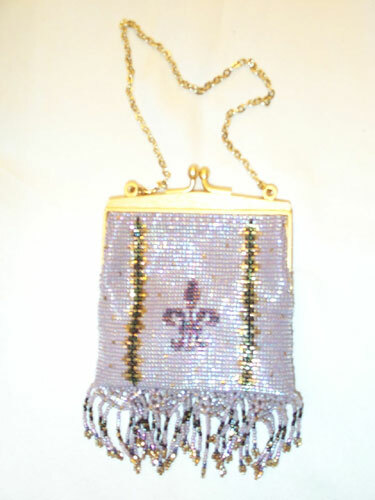 Lady Jane is a 6 x 4 1/2 inch purse. You will learn the most important reverse bead stitch to accomplish the bead pattern. The lace edge is added after the purse is completed. 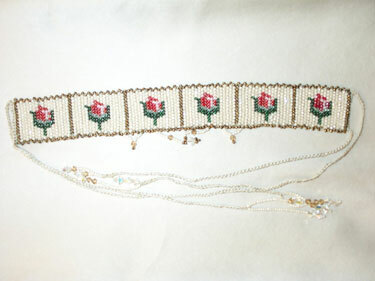 This choker is crocheted using the reverse bead stitch. You will learn how to follow the graph for the rose pattern. 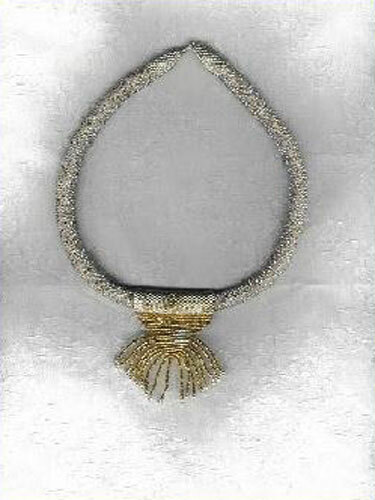 When completed you will embellish the choker with crystals. Basic crochet skills are needed. This is what one might call a special interest project. 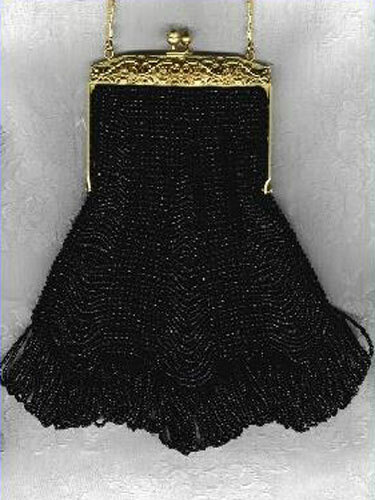 This elegantly beaded accessory, that was once the order of the day, is now a faithfully reproduced bag with vintage appeal. Unlike contemporary bracelets and necklaces that are so much in favor today, this specialty item brings back the beauty of a bygone era. 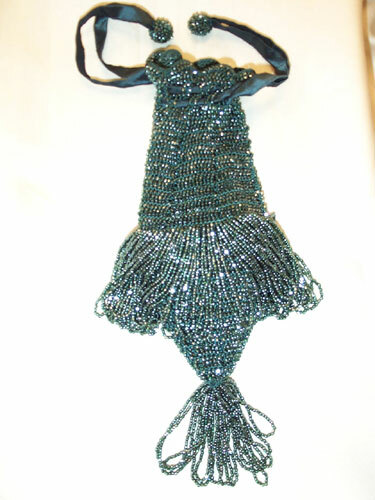 Basic crochet skills are needed to make this truly stunning beaded bag. 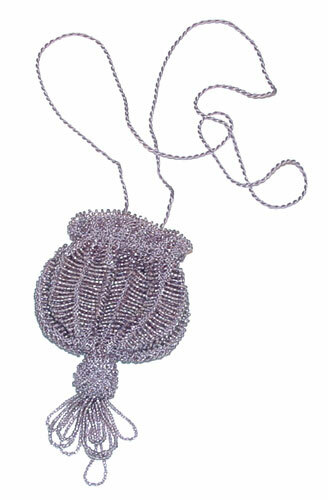 The basic knit amulet bag requires that the maker have basic knitting skills. 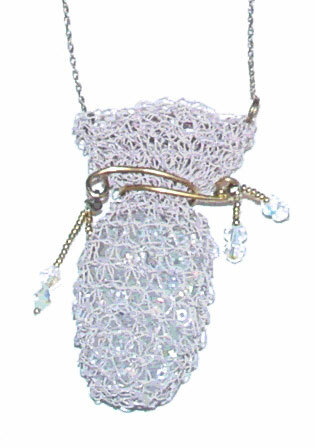 If you know how to knit, pearl, increase, decrease, cast on and bind off you will be able to make this sweet, Victorian looking amulet bag. 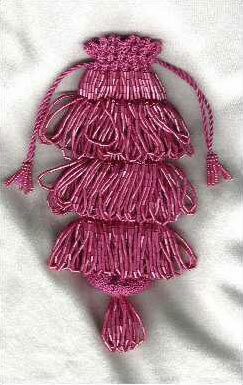 The amulet bag is approximately 2 1/2 inches by 2 inches. This is such an elegant bag. Intermediate knitting skills are required to make this purse. This stunning bracelet is knitted on black silk and combines loops of multi-colored beads matched to a beautiful dichoric glass center. The whole piece is finished with a backing of the softest leather imaginable. Despite it’s stunning appearance, this is relatively simple project that will delight both beginners and beaders with far more experience. With these instructions, you will learn basic looming skills including how to warp the loom, straight looming, increase, decrease and finishing. You will also learn a great technique called “pulling up the threads”. This is a technique that allows you to end up sewing in only 4 threads to finish the piece. You will also learn how to attach the loom work onto the brooch finding. I know you will love making this beautiful brooch. This 3 x 3 inch loomed purse is very charming, indeed. Only four threads must be sewn in when completed. Some looming experience is a must here. 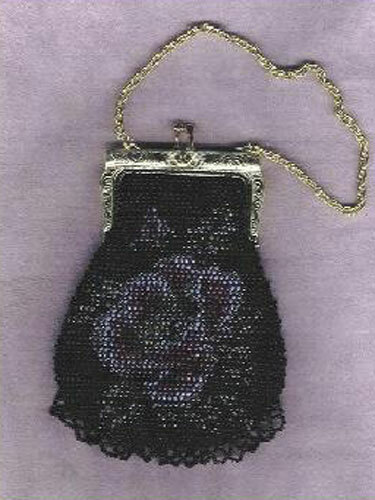 The frame that I used is available on the Purse Frames page (#104) on this site. 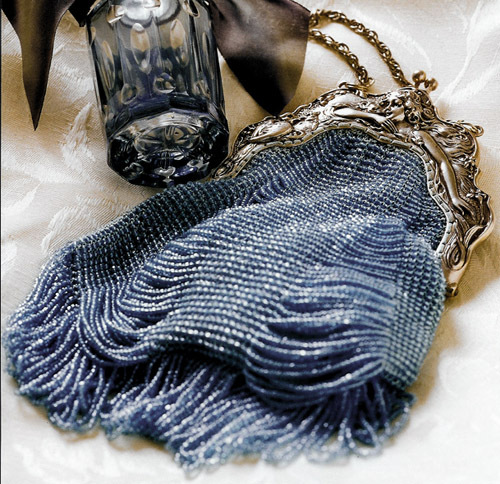 This knitted, beaded purse is reminiscent of Victorian times. There are also instructions on the purse lining. 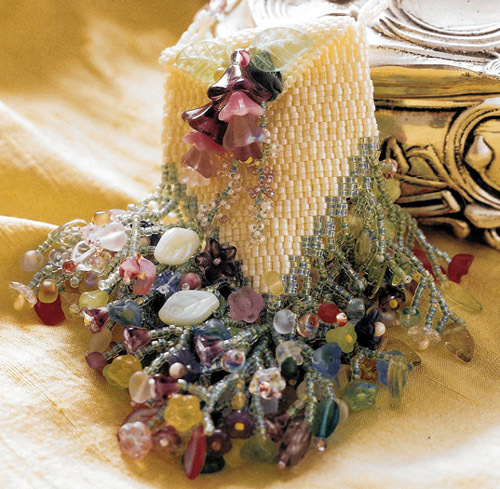 The construction is with silk thread and glass beads. Intermediate knitting skills required. This circle of double ribbed Ndebele rays makes a dazzling focal point for a beautiful watch face. 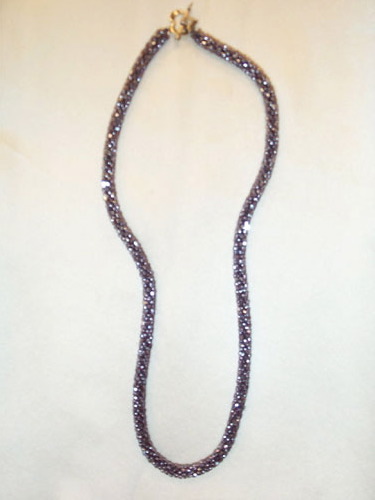 It may be worn on the necklace (as shown) or slid onto a bracelet of your choosing. You will learn how to make a double Ndebele ruffle and to capture the watch face using only beads. The Tight Twist Ndebele necklace portion is the perfect necklace to go with your new watch. This project is a bit advanced so peyote stitch and Ndebele stitch experience will be helpful. This is the easiest way to learn circular peyote stitch. You will learn how to read a peyote stitch graph. 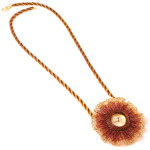 Carry a small sample vile of perfume or needles in this sweet little amulet. 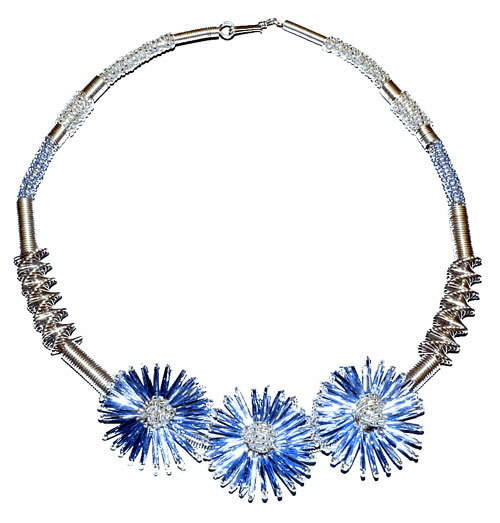 Made with Delica beads and several different gauges of wire, this necklace and earring set is a real attention getter! Learn how to coil wire in the most artistic fashion. The Wire Worker Tool Set that was used to make this necklace is available on the Supplies page on this site. 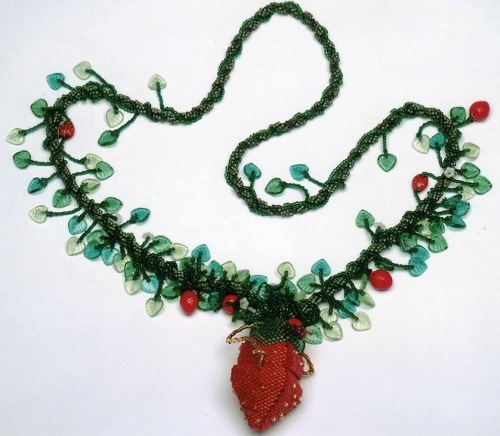 Basic peyote stitch knowledge is essential for the Strawberry Box Necklace. This unique necklace is perfect for summer. It is called a box because it actually opens up - just like a box - so you can store a favorite little whimsical charm inside. You will learn how to shape the strawberry box and how to perfectly fit the lid. You will also learn how to make the embellished spiral rope necklace. I keep a small beaded Froggy Friend inside my personal Strawberry Box necklace and I have included the instructions and materials for him. A delicate, intricately woven band of Sterling Silver wire may best be described as…a classic. Simple and yet at once exquisite, it is the single piece that is most often chosen by the world's leading designers and upper end shops for their displays. It says style and taste, luxury and bearing. 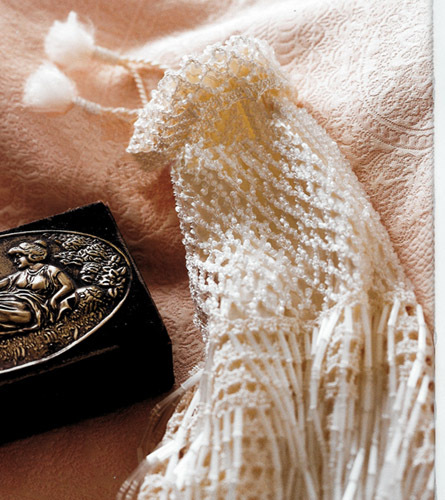 Now there is a way to make this timeless hallmark of elegance in kumihimo on your marudai. 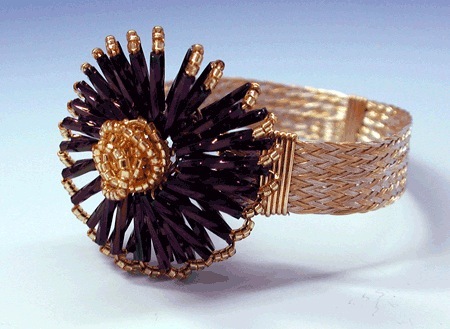 Using wire to make a flat braid, you can then combine it with a fancy bugle bead mum over the clasp. This one is sure to become one of your lasting favorites. This project is made on a traditional marudai with 13 weighted tama. This is the third in a three-part series of wire delica bead necklaces I designed for Miyuki Shoji, the Japanese Company that manufactures delica beads. This piece is featured in Beadwork Magazine October/November issue. It is extremely easy to make and a knockout to wear. No one will believe you made it. 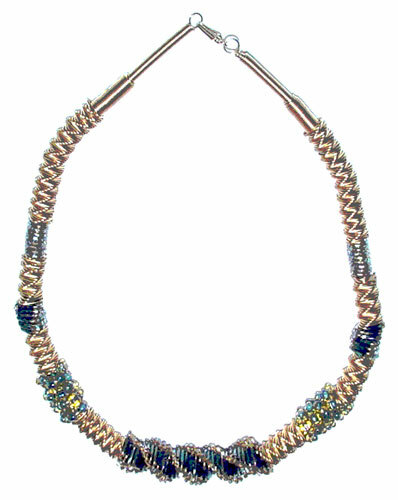 The Wire Worker Tool Set that was used to make this necklace is available on the Supplies page on this site. 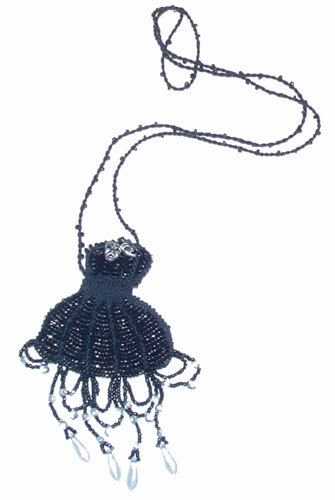 Nancy is a very easy amulet bag to make. You can make 2 pieces for the bag in the photograph or make only one piece and sew the seam for a smaller bag. Basic knitting skills are needed. This bag is 4 1/2 inches long. This is the second in a series of three wire pieces that I designed for Miyuki Shoji of Japan. You will learn how to manipulate wire using the Wire Worker Tool set. This necklace and earring set is very easy to make. The Wire Worker Tool Set that was used to make this necklace is available on the Supplies page on this site. This is a very special looming technique. Basic looming skills will be helpful. This bag is designed for a small cell phone, but is easily adjusted for size. A medium size delica bead loom is utilized.